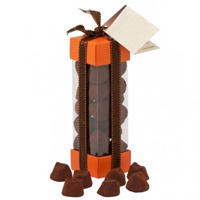 Item Description : Enjoy your holidays with your loved ones with this Toothsome Chocolate Truffles Gift Box (weight 250 gms.) packed with all exciting ingredients just to deliver fun. This Chocolate Truffles is composed with 35% of best pure Cocoa featuring intense flavor that lasts long.